Ways to Pay My Bill | Otero County Electric Cooperative, Inc.
OCEC offers members many different options for paying their bill that are both easy and convenient. Payments may be made by check, money order or cashier’s check through the mail. Include the payment stub from your bill with your preferred form of payment, using the return envelope provided. OCEC offices are open weekdays, 8 AM – 4 PM. Stop in to pay your bill and one of our friendly, member service representatives will be happy to assist you. Cash, checks, money orders and card payments are accepted in offices located in Cloudcroft, Alto, and Carrizozo. A drop box is available at each office location if you need to drop off a payment outside of normal business hours. Please only utilize the drop box if you have a check or money order. Including your payment stub with your payment is advised. Cash payments using this method are highly discouraged. Payments may be made online by visiting www.ocec-inc.com. Simply click on the “Pay Online” button in the upper right hand corner of the home page. An email address and account number will be needed the first time you login. Logging into your electric account online also gives you access to usage information to help you better manage your energy consumption. Kiosks allow our members to pay their bill at a convenient location in their service area, without having to visit one of our offices. Payment kiosks accept cash, credit/debit cards and checks. You must have your account number to make a payment. Additional kiosks will be added in the future. Payments by phone may be made 24 hours a day using interactive voice response system (IVR) technology that allows for a secure, yet easy way to make your payment. Call 1-844-846-2695 to pay by card or electronic check. Please have your account number ready. An app is available for download on your smart phone or mobile device. The app allows you the same account access as paying online, in a convenient on-the-go format. To download the app, search “SmartHub” in the app store or visit www.smarthubapp.com. Busy lifestyle, don’t want late payments? Sign up to have your electric bill payment automatically drafted from your checking or savings account each month. OCEC offers the choice of draft dates on either the 3rd or 25th of each month. To participate in Automatic Draft, members will need to fill out a form and submit a voided check or deposit slip. Forms are available on the website or at your local OCEC office. Recurring credit card payments may be set up by calling 1-844-846-2695 and choosing Option 4, by logging into your online electric account at www.ocec-inc.com, or through SmartHub on your mobile device. Download the SmartHub app for your smart phone here. Simply scan the QR code below for your respective operating system. 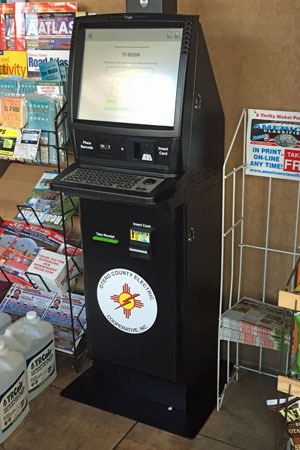 Payment kiosks offer a quick, convenient way to pay your bill at locations throughout the service territory.